Smart Kindergarten is a Comprehensive academic solution, it uses unique and effective tools for teachers and students. This level organizes developmentally appropriate activities into many lessons and sessions designed to accomplish readiness for Kindergarten as well as further strengthen the children’s self-confidence and self-esteem. 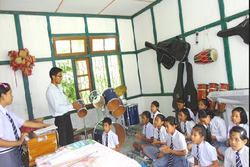 Our children get the opportunity to explore each lessons & learning sessions with the other children.